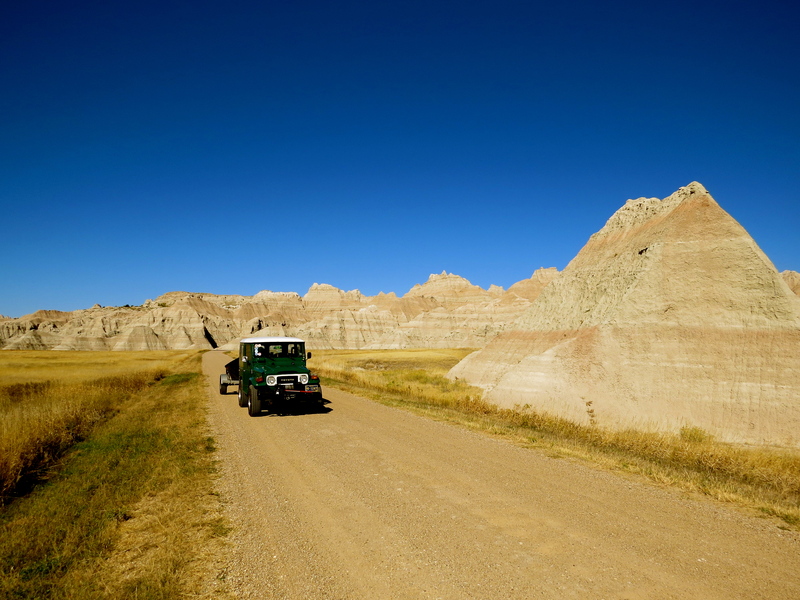 In the Badlands National Park, there is a Wilderness Area where bison, coyotes, prairie dogs, and snakes make their homes. You can be a guest there and share this space with them – at least for a night or two. 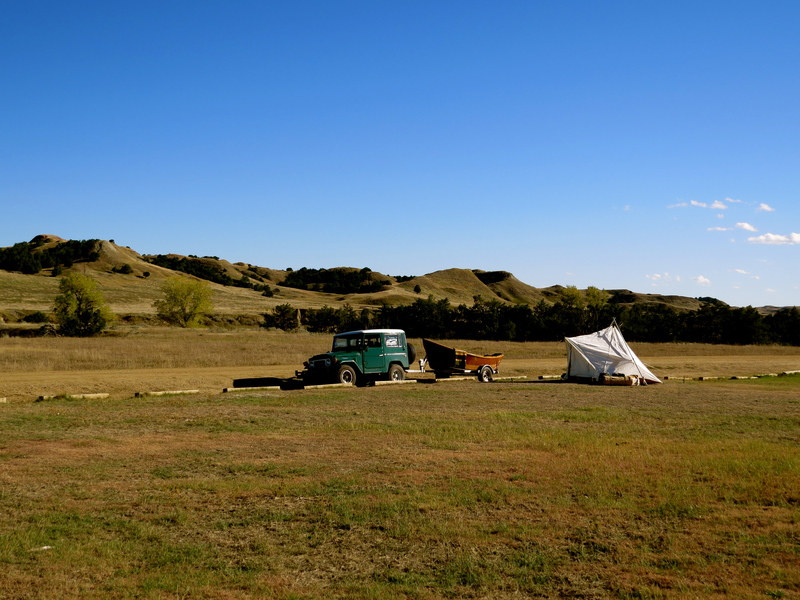 It’s the primitive camping area at Sage Creek in the North Unit of the park and if you take the rutted dusty “rim road” on the north side of the Badlands park you will find it – tucked between the gentle bluffs and rolling hills of buffalo grass in South Dakota – just southeast of Rapid City and the Black Hills. 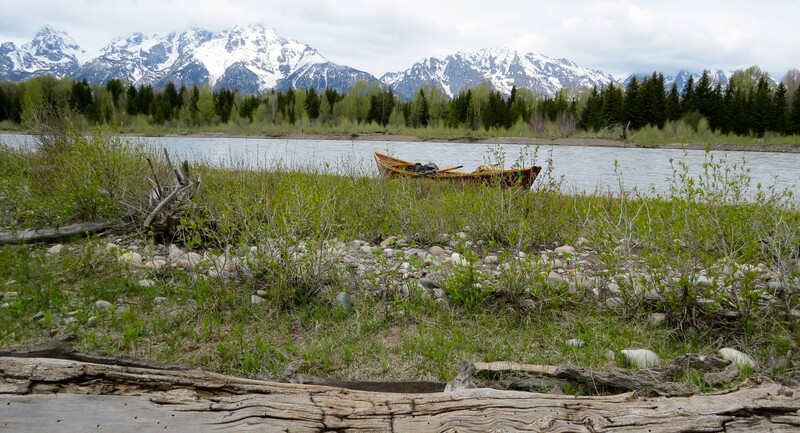 As I pulled into the area, it was a warm day for October and the only signs of life were a couple of bison calmly grazing who didn’t even look up as I rolled by in my FJ Cruiser pulling my little wooden boat. 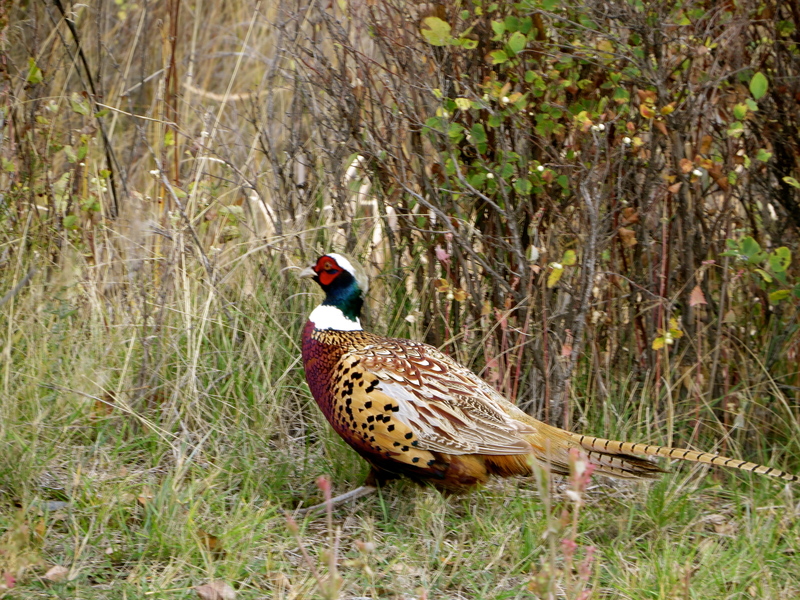 A ring-necked rooster pheasant was quite a bit more shy but still curious about the sound of loose gravel crunching beneath the tires. My window was down and I took a quick photo just before he put his head down and disappeared in the tall grass. 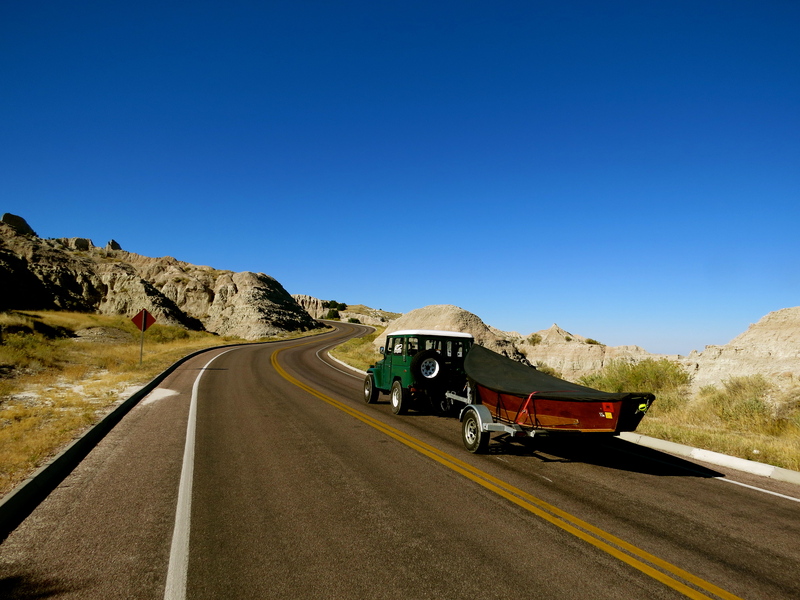 While there are no rivers to “float” in the Badlands, I was towing my boat through the park on my way to the midwest for a little off-season repair work. I’m so used to camping next to the boat on the river, it somehow seemed to “fit” in this rustic setting. If nothing else, I figured it would be a nice wind break for my campsite. I picked a level spot for the tent that was in-between buffalo “pies” that were stale and crusty and no longer smelled. 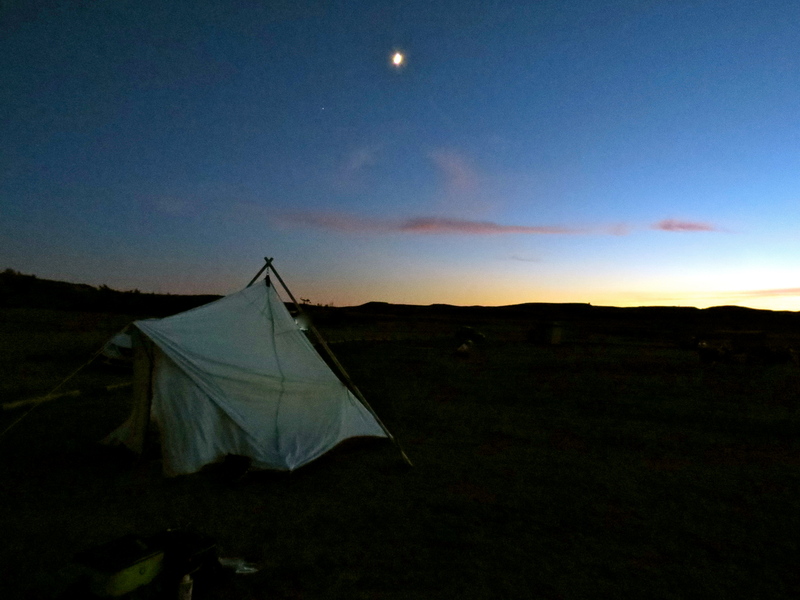 The canvas tent blended with the terrain and when camp was “set”, I pulled out my lap-top and did some late afternoon writing as the sun set and the temperatures started dropping. Such a sharp contrast – using an apple computer in such a rustic setting – but it was actually a peaceful place to write – regardless of the instrument. 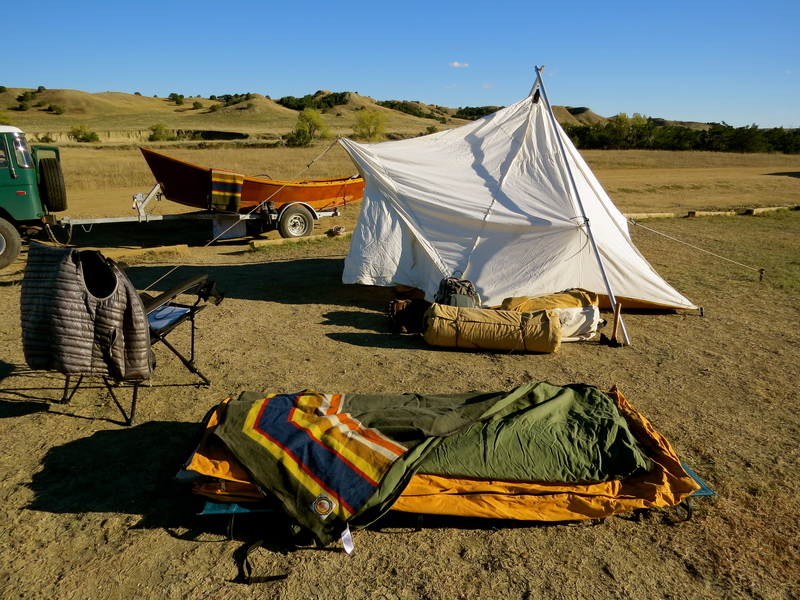 The afternoon temperatures continued to drop and when the sun set behind the hills I put on my fleece jacket, moved my Therm-a-rest cot, bedroll, and camp chair inside the tent and continued to write. Temperatures dropped to the low 30’s and the clear cloudless sky revealed stars so bright I didn’t need a flashlight. One of the most vivid memories from that overnight stay in the hills was the haunting howls of the coyotes who were prowling in and around camp all night long. Their high pitched yelps and long lonely wails made the hair on the back of my neck stand up and I hoped I would snore loud enough to have somewhat the same effect on them a few hours later. Clearly the “ages” had been at work here and the evidence was unique and beautiful. 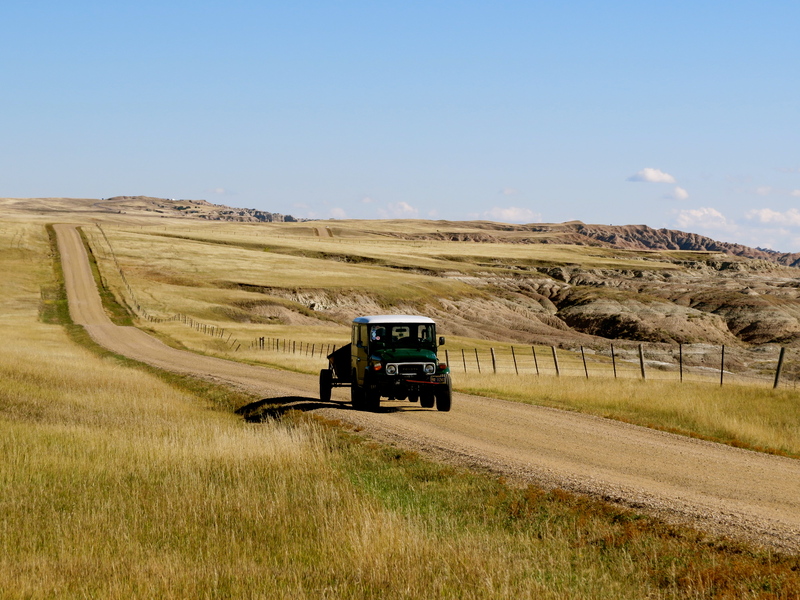 When I finally hit blacktop it was a welcome change to the washboard dirt and gravel roads that had been rattling the frame of my Toyota and my teeth for the past couple of days. And while the smooth park roads were a nice change, suddenly I felt like a park tourist and the adventure lost a little of it’s “edge” for me. The winding roads of the park snaked their way through the formations and I was glad it was off-season so I could take my time admiring the terrain without seeing much of anyone else. 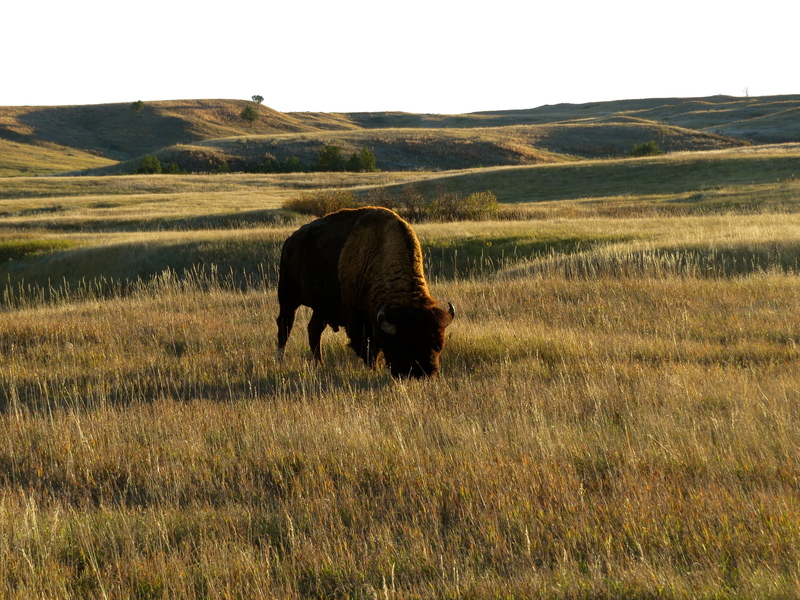 The fall colors of army green and pale yellow prairie grass stretched to the horizon on all sides as far as the eye could see and were a perfect match for the Badlands park flag and Pendleton blanket. Big dark brown Bison dotted the prairie with their heads down and plodded slowly along, grazing on the grass before the cold winds from Canada would bring snowfall to cover the prairie in just a few weeks. As I left the park and drove over the dusty ruts I rode in on – I appreciated the solitude of the setting and the fact that it remained so “unchanged”. 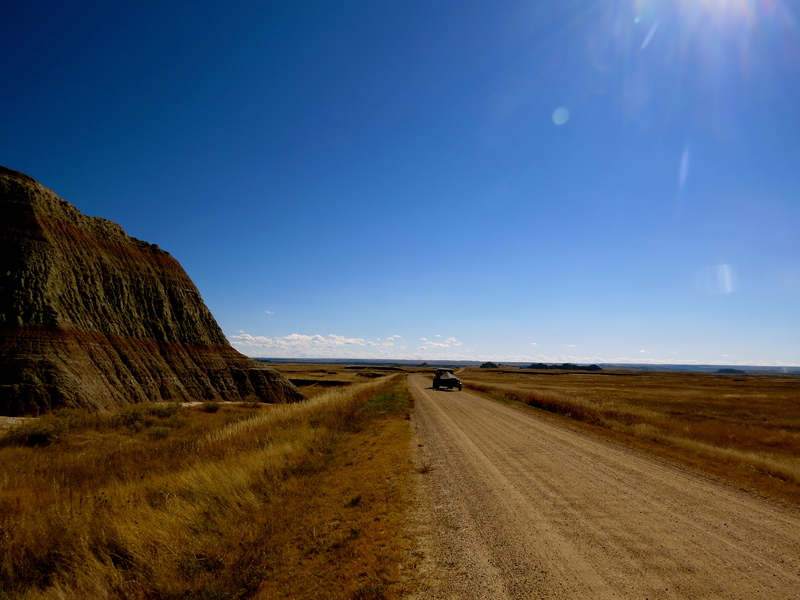 The Badlands are truly a work of art and will continue to be under construction as long as the wind blows over the prairie. 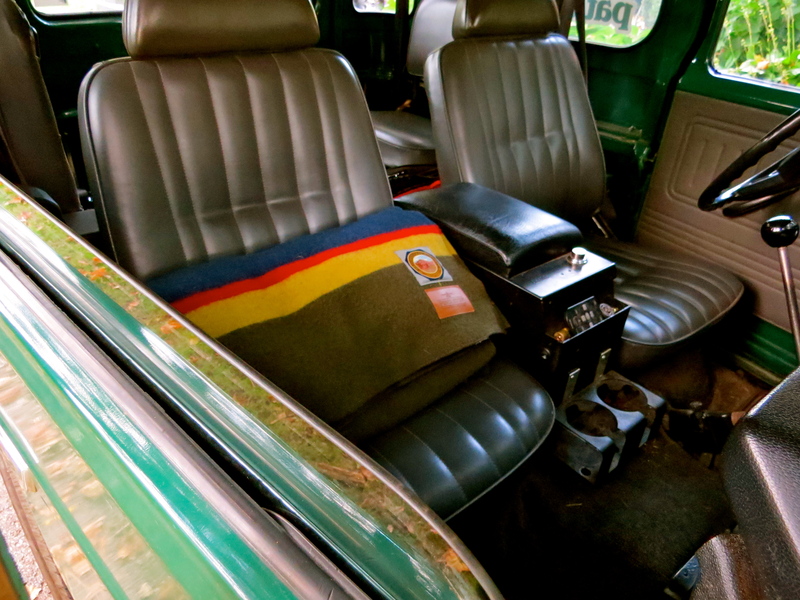 If you go there and primitive camping is not your thing… there is an “improved” campground at Cedar Pass with tent sites and RV sites – electricity, toilets, and water. The Cedar Pass Lodge is open seasonally and there are even new cabins that offer all the indoor comforts of home – with a view of the Badlands.